In October 2010, Patrick Ruddell of ChefPatrick.com held the first ever successful domain conference ON A CRUISE SHIP! More highlights to come soon from the 2011 cruise that leaves Tampa September 5th heading for Grand Cayman Islands to visit with Frank Schilling, then off to Cozumel Mexico. 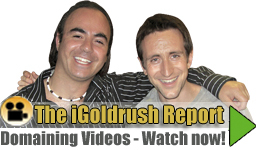 Our very own Paul Goldstone, iGoldrush CEO will be attending DNCruise 2011.